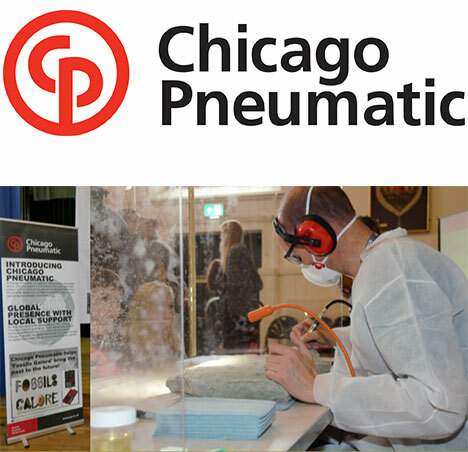 Home / News / Chicago Pneumatic Tools UK Still helping to bring the past to the future! Chicago Pneumatic Tools UK Still helping to bring the past to the future! Palaeontologist Jamie Jordan along with enthusiast and Museum Manager Sarah Moore decided to show their amazing discovery of ‘Indie’ The Iguanodon’ at an Open day in Cranleigh Village Hall in Surrey. The reason being that this was within three miles of the quarry where they discovered INDIE. The timing coincided with the summer holidays so that the local community could see for themselves what was discovered and see the many exhibits laid out for them. Part of the actual skeleton of INDIE (still encased in its clay block) was set up behind a purpose-built portable safety screen. This portable prep area was equipped with Jamie’s preferred air tool the CP9361 Air Scribe. Visitors saw the specially trained volunteers using the tool (supplied by sponsors Chicago Pneumatic) removing more of the skeleton from the clay, replicating the procedure that they carry out at the laboratory in Cambridgshire. The tool was used constantly throughout the long day and did not disappoint as this part of the skeleton began to be visible for visitors. On display behind the prep area was a near life size banner (5M x 2M) with an image of an Iguanodon skeleton and a full-size model interpretation of a full-size head printed in 3d plastic. Many of the children enjoyed taking their selfies by these displays and it really became clear how large the discovery really is.